It’s interesting to observe Leaders behavior as they begin to get comfortable with Lean and start to change their own behaviors to match the new Lean Mental Models. It’s obvious most are not comfortable, yet I always give Leaders a great deal of credit for trying, after all part of Leadership is modeling the behaviors you want others to use. 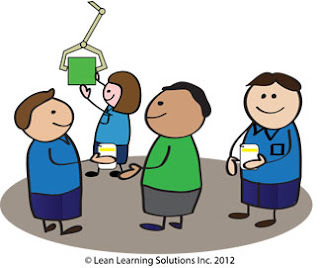 I’d like to highlight a couple of these new Lean behaviors - Going to Gemba and Leader as a Teacher. To see for yourself and understand what is really happening. To reinforce the standards of the organization and ask why when deviations occur. When leaders observe abnormalities they have two choices on how to respond. They can act like dictators and tell people to fix the problem barking out orders or they can ask why? The first does nothing to develop the capabilities of the team and at best leads to compliance behavior but does not lead people to get engaged. By asking why we get people to think and can teach them to problem solve for themselves. We engage their hearts and minds in solving the problems leaders have observed. Over time people will see these problems for themselves and become actively engaged at eliminating root causes. Sounds simple but how do leaders do this? A terrific way I observed was a leader who was just getting into the routine of a daily Gemba walk through his section of the factory. He observed a group of operators struggling to keep a piece of machinery running. The equipment was dirty, covered in oil and grime. He could have told the team members what he wanted done but instead asked them why were they having trouble getting the machine to run? They replied that it was an old machine. Another question – what was the problem with the old machine? No one could pinpoint the problem except to say that it hadn’t been maintained in recent years. At this point the leader started explaining the concepts of 5S and Visual Management and how they were the foundation of TPM (Total Productive Maintenance) and with these techniques equipment could be put into a like new condition once again. Since the factory was noisy he used a set of pocket cards and images to help explain these concepts to the team. The pictures were like a thousand words. The Team Members understood what needed to be done but more importantly they understood why. They began to work on simple ways to improve the performance of the equipment and over time developed daily clean and inspect checklists, visual indicators of performance and found many sources of problems including air and oil leaks, loose fittings and contamination. The equipment started to run better and the maintenance team was freed up to work on the deeper, more complex machine issues. A good news story all around driven by a leader who understood his role of teaching his people and building their capability so they can engage and solve problems for themselves.